WASHINGTON DC– A senior member of the US House of Representatives and a team of senior and international lawyers have condemned what they called arbitrary arrests following reports that security agencies reportedly raided a hotel in which Kyadondo East MP Robert Kyagulanyi aka Bobi Wine had booked in last night in Jinja. Bobi Wine and a team of others on social media claimed Police in Jinja District raided City Hotel in which he had booked into in search of him. Bobi Wine who was slated to have a music show in Jinja on Saturday evening also claimed that police had ordered his team out of the town, arrested some and escorted others up to Lugazi on ‘gun point’. Bobi Wine in a statement on Facebook said; “They have beaten some of them, dragged them onto police pick-up cars and driven them to unknown destinations for no offence whatsoever. Meanwhile, I am still in Jinja town. The police are looking for me everywhere. They have even blocked some roads in search for me! I will try not to avail myself to them- Arua is still fresh in our minds, and we know what they can do. But this injustice must end and we must put it to an end by ourselves. No one else will do it for us,” Mr Kyagulanyi posted on his social media platforms on Saturday evening. US Congressman Bradley Sherman on social media attacked Ugandan government saying they must commit to essential principle of freedom of speech. 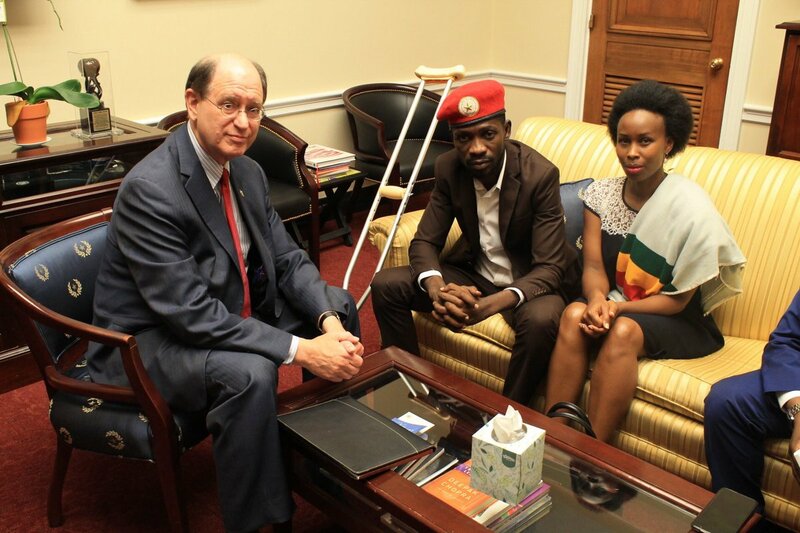 “Earlier this year [September 2018], I met with Bobi Wine after he was brutally beaten and detained by Ugandan security forces for speaking out against corruption. Today they have reportedly surrounded him and his team. The Ugandan government must commit to the essential principle of freedom of speech,” Mr Sherman tweeted Sunday morning. 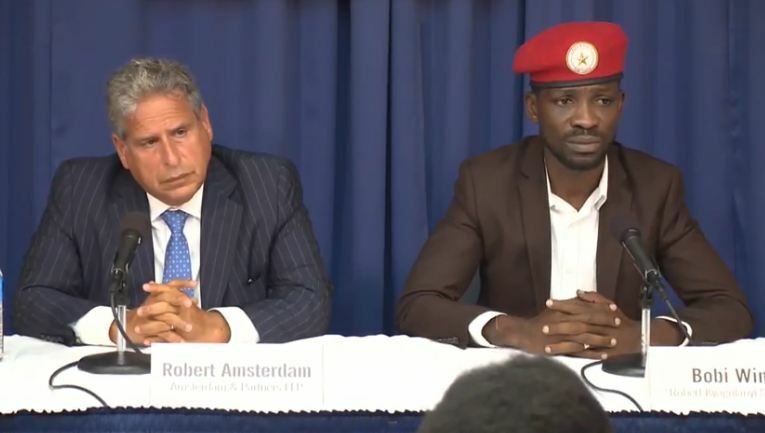 Bobi Wine’s US lawyer Robert Amsterdam in a statement issued on Saturday night, said: “This is a clear and brazen act of targeted political repression by the Uganda authorities aimed at violating Bobi Wine’s human rights,” said Amsterdam. There’s now reports of Ugandan police setting up roadblocks on the Kampala-Jinja highway in their unlawful attempt to detain Bobi Wine. They have no legal basis to seek arrest, and they still aren’t even bothering to invent a pretext for this thuggish use of state power. Others who have since condemned the incident include California Democratic Rep. Karen Bass and former New Zealand Prime Minister Helen Clark also urged Uganda to allow opposition space. “Reports are coming out that Bobi Wine may be in danger in Uganda. Stifling freedom of speech and expression and arbitrary arrests have no place in a democracy,” Bass tweeted. For Prime Minister Helen Clark, “Disturbing reports from Uganda where Opposition MP Bobi Wine is again in hiding following police violently arresting members of his concert crew. Bobi was badly hurt in an earlier violent arrest and detention. Government must allow opposition space,” she tweeted. We are closely tracking the events happening in Jinja, #Uganda, where authorities have once again targeted opposition leader and artist @HEBobiwine. The continued threats, intimidation and arbitrary arrests of him and his colleagues are unacceptable and cannot continue to happen.